Orthodontic treatment is part of a comprehensive dental health care plan. It enhances your oral health and creates beautiful smile. Teeth can last a lifetime with good oral care. People with crowded or crooked teeth are said to have a “bad bite.” The teeth may look straight but the upper and lower teeth may not fit properly. It is harder to clean crooked teeth and this could lead to tooth decay, gum disease and tooth loss. Orthodontic treatment straightens the teeth and creates a “good bite ” where the upper and lower teeth fit properly. It is easier to clean, chew and speak with a good bite. Who can undergo Orthodontic Treatment? Both children and adults can undergo orthodontic treatments. Orthodontic treatments can be started as early as age eight. Recently many adults are opting to undergo orthodontic treatments at age 50+ too. Important criteria for orthodontic treatment is viable healthy bone for tooth movement. The orthodontist will select the type of appliance based on the patient’s age and treatment needs. 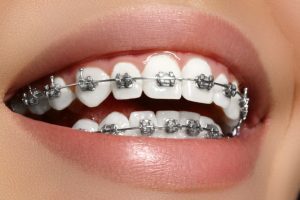 Braces are available for patients of all ages. Treatment that begins while a child is growing helps produce the best results. Most treatment begins when patients are between 8 and 14. During the early developmental growth of jaw bone, the teeth size can be measured through diagnostic radiographs. By this measurement the anticipated space for the permanent teeth can be precisely planned. Also it is possible to guide the teeth and modify jaw alignment for good stability. Over the years research has shown that early orthodontic treatment started during “growth spurts” has more predictable outcome in teeth alignment. Adults can undergo orthodontic treatment too. There is no age limit on when the orthodontic treatment can be started. Teeth can moved at any age. The orthodontic process involved in moving teeth is the same for all ages. It’s never too late to create a “good bite” and a beautiful smile. Also, modern orthodontic technology has reduced treatment time to 18 -24 months. Important benefits of orthodontic treatment is the ability to brush and clean teeth easily. This will prevent gum disease which is the foremost dental condition for tooth loss in older population. 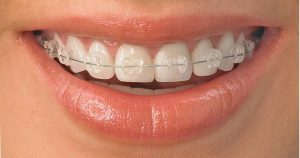 Metal Braces Metal braces are made of sturdy stainless steel. In the type of metal braces we use, the brackets are smaller and easy to clean. Hidden Braces Hidden braces are not visible from outside, the metal brackets are placed on the backs of the teeth. In some complex cases, the upper or lower jaw sticks out causing uneven bite. Surgery may be needed to align the upper and lower jaws. How Does Orthodontic Treatment Working? Many different types of appliances, both fixed and removable, are used to help move teeth, retrain muscles and affect the growth of the jaws. These appliances work by placing gentle pressure on the teeth and jaws. The severity of your problem will determine which orthodontic approach is likely to be the most effective. If you recognize any of these signs in your child or yourself, call us at (03) 9387 0709 for a consultation with our Orthodontist.